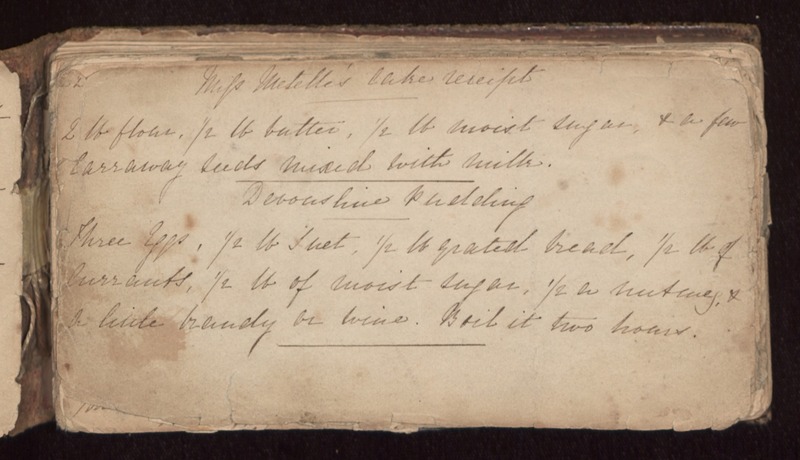 Miss Metelle's Cake Receipt 2 lb flour, 1/2 lb butter, 1/2 lb moist sugar, & a few carraway seeds mixed with milk. Devonshire Pudding Three eggs, 1/2 lb suet, 1/2 lb grated bread, 1/2 lb of Currants, 1/2 lb of moist sugar, 1/2 a nutmeg, & a little brandy or wine. Boil it two hours.